BOWLING GREEN, OH— Orchestral compositions written by Bowling Green State University College of Musical Arts students will be read, rehearsed and recorded by Toledo Symphony Orchestra (TSO) musicians on Tuesday, Nov. 10, from 3:30-6 p.m. in BGSU’s Kobacker Hall. Michael Lewanski, a prominent figure on the international contemporary music scene, will lead the orchestra while acclaimed composer, conductor author and educator Samuel Adler will be present to observe the session and give comments in an evening masterclass. The TSO will be bringing its largest complement of players to BGSU, 72 musicians in all. “Few academic institutions can offer this kind of professional experience, making this a unique opportunity for BGSU students,” said Christopher Dietz, a faculty member in musicology, composition and theory and organizer of the session. The event is open to students, faculty and staff of the BGSU College of Musical Arts and invited guests. Members of the public who would like to attend should email faculty liaison Christopher Dietz (cjdietz@bgsu.edu) to be included on the guest list. Adam D. O’Dell’s article discussing The Influence of Gregorian Chant on Morten Lauridsen’s O Magnum Mysterium was recently featured in IFCM’s International Choral Bulletin. A fragment of his article is quoted below. “Morten Lauridsen is one of the most frequently performed living composers. His works span a number of disciplines and influences, including trumpet concertos, orchestral works, and chamber works. His most influential works, however, are undoubtedly his choral pieces. His choral works are based on sacred and secular texts alike, and each of them carries influence from the era in which the texts are written. His most purchased and most performed work is his setting of the O Magnum Mysterium text. The International Federation for Choral Music (IFCM) is an international association founded in 1982 to facilitate communication and exchange between choral musicians throughout the world. IFCM has around 900 members from all continents. The members are individuals, choirs, organizations, or companies. Through the organizations and choirs IFCM plays a role in choral music and choral events in the world. O’Dell (b.1992) is currently pursuing his MM in Composition at Bowling Green State University in Ohio, studying with Dr. Chris Dietz, and working as a theory teaching assistant. 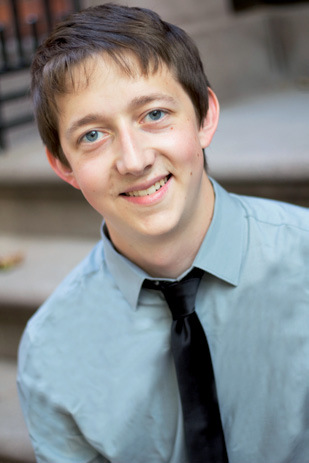 He recently graduated with a BA in Music from Clarke University in Dubuque, IA, where he studied composition with Dr. Amy Dunker, and piano with Nancy Lease and Dr. Sharon Jensen. His research interests include Biomusicology and the study of older styles on modern composition, including Sacred Harp. He has won awards from the Kennedy Center and Make Music Inc. His works have been performed across the United States, Brazil, and the United Kingdom. He is a member of ASCAP and SCI, and is a licensed PARMA artist. Alumnus D. J. Hoek has been appointed Associate University Librarian for Collections Strategies at Northwestern University. After serving over ten years as Head of the Northwestern Music Library, he will now be in charge of all library collections and will align the library’s collection with university priorities and goals. He received Master of Music degrees in both composition and music theory from BGSU in 1996 and a Master of Library Science degree from Indiana University in 1998. The competition received 23 applications from 11 countries including the US, Canada, UK, Argentina, Brazil, Finland, France, Greece, Hungary, Italy, and Spain. The quality of submissions was very high and the creative and technical ideas inspiring. We thank everyone who proposed so many great projects and wish we could accept them all. Stay tuned for news about the 2016-17 KEAR opportunity, which will be announced in early 2016. We welcome all applicants who want to explore multi-channel, live performance, and/or Ambisonic projects. Associate Professor of Piano, Thomas Rosenkranz will serve on the jury for the Shanghai International Open Piano Competition from October 1st-4th. Professor Rosenkranz is currently on a faculty improvement leave living in Chengdu, China. Eftychia Papanikolaou, Associate Professor of Musicology, has been invited to present two pre-performance lectures at Toledo Opera’s production of Giacomo Puccini’s Madama Butterfly, Friday, October 2 at 6:30 p.m. and Sunday, October 4 at 1 p.m. The allure of the East had captivated opera audiences for the better part of the nineteenth century—tales of the Other constructed through European lens offered boundless opportunities for visual splendor and aural opulence. Written at the dawn of the new century, Madama Butterfly (1904) constitutes Giacomo Puccini’s answer to japonisme, the overwhelming fascination with everything Japanese that thrilled Europeans and Americans alike after 1860. The opera transports us to the exotic world of nineteenth-century Japan and the ill-fated love between a 15-year-old geisha and an American naval officer. The innocent but passionate Cio-Cio-San (Butterfly) marries the conceited Lieutenant Pinkerton, only to be abandoned when he returns to the US. The stereotypical portrayal of the two protagonists gives us a glimpse into the uneasy historical context that surrounded the encounter between East and West. Puccini’s score, peppered with traditional Japanese music he studied while composing the opera, leaves no doubt about the irresistible power of the music to move, surprise and seduce us. It invites us to leave behind our present-day post-colonial anxieties and rather indulge in the emotional cornucopia and dramatic finesse of one of the composer’s finest creations. Toledo Opera’s Madama Butterfly is a production of the so-called “Brescia version” of May 1904, the revision that Puccini fashioned three months after the disastrous premiere at La Scala. The opera would undergo several more revisions, until its standard version was established in the Paris production of 1906. For more information please visit ToledoOpera.org.